Keep your skin appearance young and healthy with top quality products. Catching the ball and frantically aiming it towards the net, it’s an easy shot, until your opponent body slams you trying to wrest it from you to get himself a score. You fall and your elbow hits the ground first. It’s not horrible, but when you get home it starts throbbing, or, your knee just gets stressed after jumping on a concrete court. As careful you might be, certain sports carry a high risk factor when it comes to injuries. Contact sports such as football have a higher rate of injury than non-contact sports such as swimming but both can cause aches and pains. Sports require repeated gestures and sometimes direct body contact with your teammate or opponent which can cause stress and fatigue in and on your body. Usually salves such as ben-gay are great on the spot treatment but it doesn’t necessarily get to the root of the issue. Repeatedly using your mouse and typing on your computer key board for work which can cause Carpal Tunnel Syndrome and results in severe discomfort. It’s difficult to function properly when you are not comfortable and your everyday moves cause aches and pains. Injuries can have lingering effects. When the weather changes and it gets cold outside or dampness abounds it creeps into your joints and you need relief-Instant relief and reparative relief. B-Cure is an innovative handheld soft laser device that can be used at home safely to ease muscle pains, inflammations and various discomforts that can put a damper on your daily activities. The effectiveness of this user friendly device was once found only in clinics or hospitals and required going out of your way to find expensive relief. Used it in the comfort of your home or even at the office, B-Cure is as effective as the fancy clinics and doctors’ offices have to offer but in a portable rechargeable handheld device . Treat yourself to pain relief and reparative therapy that can be done safely several times a day with no adverse side effects. The relief is amazing and cost effective, it pays for itself in no time not only monetarily but it grants you relief in just a few minutes and effectively allows you to take charge and not let the pain take over. Athletic injuries to the back, knees, elbows, shoulders, etc. Pain management is essential, or else these pesky aches and pains can take over your life! Let B-Cure ease your discomfort and give you a new lease on life! This entry was posted in Anti Aging, Pain Relief and tagged B-Cure, pain treatment on February 2, 2014 by admin. Pain can change your life making certain tasks cumbersome or unbearable. Long -term or chronic pain can put a damper on activities that are normally taken for granted and cause you to readjust your life in ways you’d never have expected causing bad moods or even depression from the frustrations over the newfound limitations imposed on your life. It causes stress which in turn can exacerbate the pain. Continuing activities that you love is very important and searching for solutions on how to manage the pain so that with treatment you can resume your daily goals. There are many things that can cause pain – an injury, arthritis, migraines, carpal tunnel syndrome, bedsores, gum disease, dental surgery. Since these discomforts can linger for days, weeks, and months; sometimes it seems like forever and a reliable solution must be found to treat them. What is the best way to manage these ailments? There are many approaches to pain management. Some treatments are more invasive than others such as cortisone injections and acupuncture. The problem is that the injections are limited and have a temporary effect and sometimes can cause an allergic reaction. Although acupuncture is a sought after treatment for people who aren’t happy with the “western approach” there are no definitive studies proving its effectiveness. There are salves, oils and even exercise that some people turn to for relief, but it all boils down to what works effectively and helps alleviate the pain without side effects. An innovative and revolutionary machine can manage your pain using soft laser therapy is now on the market for personal use. The B-Cure Laser device is a CE approved, light, portable, rechargeable device, which is easy to use for self-treatment at home and on the go. No need for multiple clinic visits when you can use this user friendly device to help you manage pain in the comfort of your home without any side effects! It penetrates the surface without heating or hurting the skin treating not only the pain but the source of the pain giving you relief in within six minutes. It stimulates and repairs the cells and reduces the inflammation as well. The B-Cure can help solve all different types of pain mentioned above and even help medical skin conditions such as acne and bedsores. . This versatile machine can even be used in the mouth and on the gums to promote healing after dental surgery. 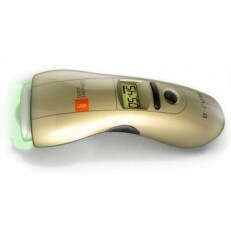 The B-Cure handheld device is a higher end home soft laser device using 250 mW compared to the other CE approved devices on the market which have lower power and are less effective. 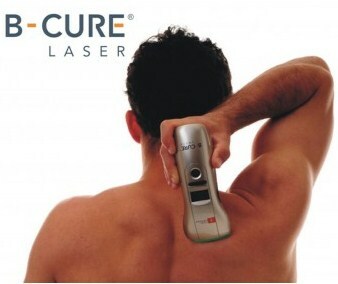 Of all the commercially available portable devices on the market The B-Cure LASER has the largest treatment area (4.5cm²) so it is quicker and more effective since it has more strength than the other devices available it can treat and heal a wider variety of problems. In increments of thirty seconds you can set the exact time of your treatment. The average treatment time is recommended for six minutes twice a day. Since it is portable and easy to use you can bring it on a trip or to work with you, so you are not limited to a particular time or place. The B-Cure can make a difference in your daily pain management helping you alleviate and subdue the discomfort so you can get on and live life to its fullest. This entry was posted in Anti Aging, Pain Relief and tagged B-Cure, pain treatment on January 29, 2014 by admin. The new ELOS Touch Advance 500K is here! Stop the pain with LLT innovative technology!